INXPO HTML5 Webcasting Cloud Will Drive Engaging Communications and Generate More Qualified Leads. INXPO has added HTML5 streaming technology to enhance the delivery of Online Events as part of INXPO’s Event Cloud®. The next generation HTML5 webcasting service beta was launched on June 25, 2016 with the INXPO 12.9 release. INXPO continues to move the industry forward with its HTML5 Webcasting product, offering a plug-in free, flexible audio and video streaming technology. Embraced by mobile browsers with its responsive interaction, the webcasting product pushes engagement with high quality video and animated content on any device. “With our webcasting platform redesign, we took into consideration the enhancements our customers were looking for, so that the product is intuitive and simple to use while still offering industry leading technology,” said Ryan Vahey, Senior Product Manager for INXPO. Key features of INXPO’s HTML5 Webcasting technology include a single stream layout alternating between presenter video and slides, speaker sub-titling, multilingual audio tracks, and closed captioning. 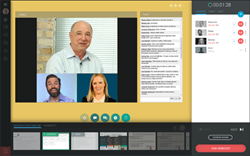 For presentations with multiple speakers, self-audio detection and split screen presenter views provide for seamless conversational and highly engaging webcasting. “I believe our HTML5 Webcasting is the greatest product release in the webcasting space. A single webcasting product that services audio presentations to enterprise grade engaging video sessions spanning across the entire INXPO Event Cloud® product line,” commented Drew VanVooren, President of INXPO. As part of INXPO’s EaaS (Events as a Service) offering, HTML5 Webcasting will be offered to customers as a full service or self-service option. INXPO is proud to continue having the highest standard of technology for their Event Cloud® platform and has set the bar higher than ever. For more information on the HTML5 Webcasting cloud service, visit http://www.html5webcasting.com. INXPO’s Event Cloud® empowers organizations to reach their stakeholders through engaging online video events — on any device, at any time. Our solutions for Marketing, Corporate Communications, Training and Sales Enablement are trusted by many of the world's most esteemed enterprises, including Aon, Cisco, Gap, Microsoft and United Healthcare, to create memorable online experiences. To learn more about how INXPO can fit into your organization's communications strategy, contact us at contactus(at)inxpo(dot)com or call us at (312) 962-3708.